Police say five people have been killed in a shooting in suburban Pittsburgh and at least two gunmen are at large. 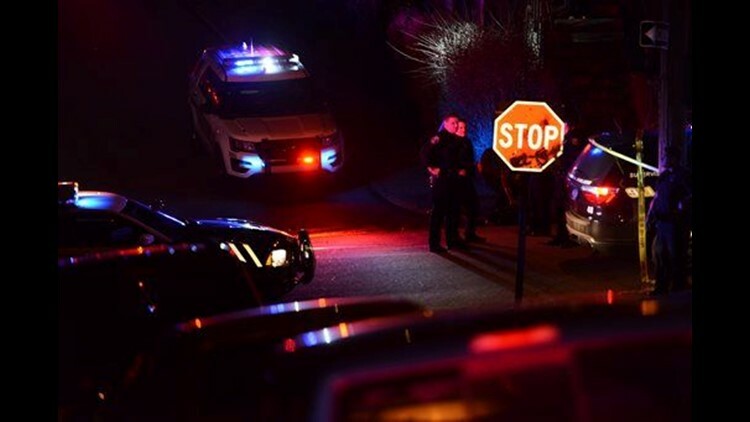 WILKINSBURG, Pa. (AP) — Police were searching early Thursday for at least two gunmen who opened fire during a backyard party in suburban Pittsburgh, killing five people and wounding three others. Four women and a man were killed late Wednesday during the party in Wilkinsburg. Allegheny County police said people scrambled toward the house as bullets began flying. Four of the victims were found dead on the back porch. The other died at a hospital. Two men were in critical condition and a woman was stable, police said. Lt. Andrew Schurman of the Allegheny County homicide unit said the gunmen barged into the party just before 11 p.m. and opened fire in an ambush-style attack. He said gunshots came from two distinct locations, but police don't believe anyone at the party fired back. "It looks like right now they were all fleeing toward the backdoor of the residence when the second gunman fired from the side of the yard," he said. "They all seemed to get caught on the back porch." Wilkinsburg is a poorer, largely blighted suburb just east of Pittsburgh that is known for drug trafficking and gun violence. But, neighbors described the street on which the shooting occurred as generally quiet and expressed shock. Resident Kayla Alexander told WPXI-TV that she heard a barrage of gunshots — more than 20. James Boyd, 70, has lived in a home three doors away from the shooting for 24 years. He told the Pittsburgh Post-Gazette that the gunfire "went on for almost a minute." "I thought it was maybe the pipes bursting. But then we realized it was gunshots. We've had trouble in this neighborhood before but never this close to home," Boyd said. "I've never seen anything like this before."